A leading international authority on dementia and ethics has called for a 'revolution in attitude' to dementia by governments and society. 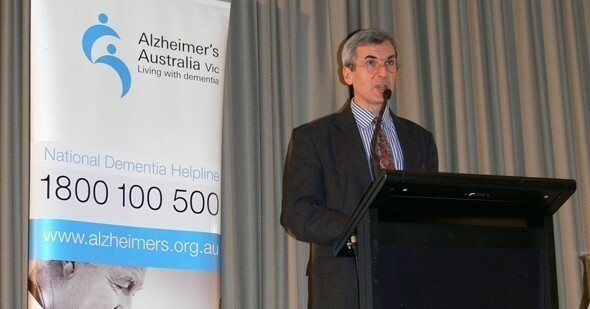 Professor Julian Hughes, who is in Melbourne on a lecture tour as a guest of Alzheimer’s Australia, says that governments and society need to dramatically change attitudes to dementia in order to tackle the enormous challenges it is bringing. Professor Hughes, who is visiting from the UK, says there is little sign that governments world-wide have grasped the enormity of the impact that dementia will have on the health care system or the everyday ethical issues that need to be addressed in dementia care, including diagnosis, restraint and end-of-life issues. A key test of governments’ willingness to reduce the future numbers of people with dementia and provide better care is funding for dementia research. And on that score he says they are failing, as funding for research into dementia is disproportionately low compared with other chronic conditions. He says combined research funding on dementia in Australia was just $22 million for 2007–09, compared with $160 million for cancer research. As well, spending on research for cardiovascular disease was $110 million for the same period, and for diabetes that figure was $60 million. Dementia is the third leading cause of death in Australia, behind heart disease and stroke, and there are an estimated 257,000 people in Australia with dementia. Primarily owing to the ageing population, that is set to soar to more than a million by 2050. By the 2060s, spending on dementia is set to outstrip that of any other health condition. Dementia is the term used to describe the symptoms of a large group of illnesses which cause a progressive decline in a person’s cognitive ability. It is a broad term used to describe a loss of memory, intellect, rationality, social skills and physical functioning. Alzheimer’s disease is the most common form of dementia. Prof Hughes says investment in research is a fundamental ethical consideration in the appropriate care of a person with dementia and organisations, institutions and governments must face up to the dementia challenge, not for mere practical reasons, although these are important, but because this is a human moral necessity. He says these challenges are ethical challenges at the individual level, but they also pose social, legal and political challenges. Professor Hughes is a consultant in Old Age Psychiatry and Honorary Professor of Philosophy of Ageing with Northumbria Healthcare NHS Foundation Trust and the Institute for Ageing and Health at Newcastle University in the United Kingdom. He is visiting each State and Territory in Australia on his lecture tour, Ethical Issues and Decision-Making in Dementia Care, for Alzheimer’s Australia. Ethical issues involved at end-of-life care and access to good palliative care.